To reduce significantly the risks of accidents/incidents and their consequences related to the use of munitions, it is necessary to design specific packaging, modify internal architecture, and combine new compounds of energetic material to be used, etc. IM use propellant and explosives based on low-sensitivity energetic molecules (TATB, NTO, …) in appropriate formulations. 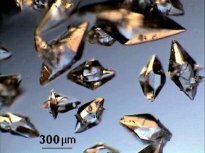 Large CL20 particles are now crystallised. High charge rates can be achieved to obtain powerful PBXs for shaped charges or new generation warheads. 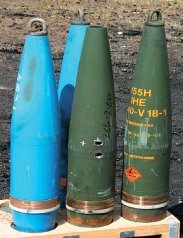 The new 155 artillery shell Rh40 fielded with cast-cured PBX Rh26® has successfully passed IM tests despite the strong confinement of the charge. With the insensitive booster formulation Rh B3, the main charge Rh26® can be successfully initiated. The mass production of this IM shell is starting. The process engineering of a formulation with 90% of solid and only 10% of a special binder system was a big challenge. Below: IM charge for 155 artillery shells (155mm Rh40) – Rheinmetall IM shells after bullet attack. Structural materials reduce the risks of projections by mechanical breaching. Heat propagation in the event of fire is controlled by specific lining materials.